How do I qualify for coverage as a project-based employee? New Participant: You are considered a New Participant when you enter the Plan for the first time. You will remain a new participant until the Plan can “look back” and assess your hours over an entire measurement period. Continuing Participant: Open Health has two annual Measurement Periods that last 6 months, November through April and May through October (see the Eligibility Examples below). 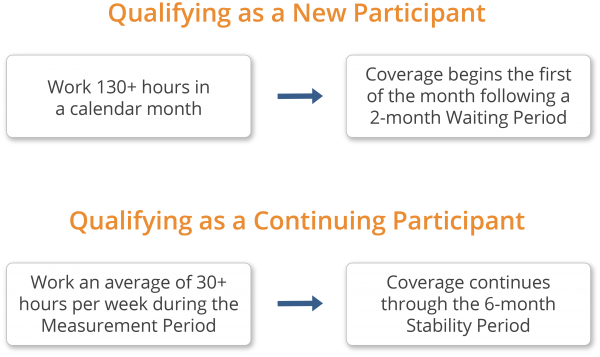 Once you have been a plan participant for a full Measurement period you are considered a Continuing Participant. Example 1: You enter Open Health on March 1 and report 130 hours in March while working for participating member employers. You become eligible for coverage after a two-month waiting period. During the waiting period you will receive Plan enrollment information. Your insurance coverage will begin June 1. Your Initial Employment Period begins when you enter Open Health and extends to include a full Measurement Period and the following Admin Period. In this example your Initial Employment Period begins March 1 and ends December 31. Example 2: You enter Open Health on March 1 and report 130 hours in March while working for participating member employers. You become eligible for coverage after a two-month waiting period, and your insurance coverage begins June 1. You have no hours reported for 9 consecutive weeks (during June and July); therefore, your coverage ends July 31. You report hours in August and therefore regain coverage September 1 and remain insured until such time a Measurement Period can determine coverage for the next Stability Period. In this example, you averaged fewer than 30 hours per week during your first Measurement Period (May through October), so coverage ends December 31. Example 3: You enter Open Health on March 1 and report 130 hours in April while working for participating member employers. You become eligible for coverage after a two-month waiting period, and your insurance coverage begins July 1. You averaged 30+ hours per week during your first Measurement Period (May through October), so coverage continues through the first Stability Period (January through June). You then averaged fewer than 30 hours per week during your second Measurement Period; thus, coverage ends at the end of your first Stability Period (June 30). From March to July in Year 2 you have 22 weeks of inactivity. As such, when you begin to report hours again to the Plan you begin a new Initial Employment Period.